Thank you to Pamela’s Products for sponsoring this post and giveaway. In the last few weeks, I’ve read a bunch of articles and blog posts on the subject of home-cooked family dinners. The big question is: are they more pain than they’re worth? My opinion lies somewhere in the middle of that argument, as there are plenty of opinions to go around on both sides. I think it’s so, so important to sit down as a family as often as schedules allow to share a meal together. Sometimes we miss a day here and there. Is it always dinner? No. Sometimes it’s breakfast or lunch. But over all, we try, but we certainly aren’t perfect. In any case, I really enjoy sitting down with my family to discuss our day, whether it’s beginning or ending, without distractions. My kids relish the time with us too. This is especially important to me now that school is back in session. One common complaint about family dinners at home is that it takes too long to make something healthy. We are all busy, and that is true of some recipes. But not this one! As a kid, one of my favorite quick meals was my grandmother’s tamale pie. It was delicious and super easy to put together.I haven’t made it in years! Using Pamela’s Gluten-Free Cornbread and Muffin Mix, I recreated it for my family. And it’s even easier than my grandma’s recipe. 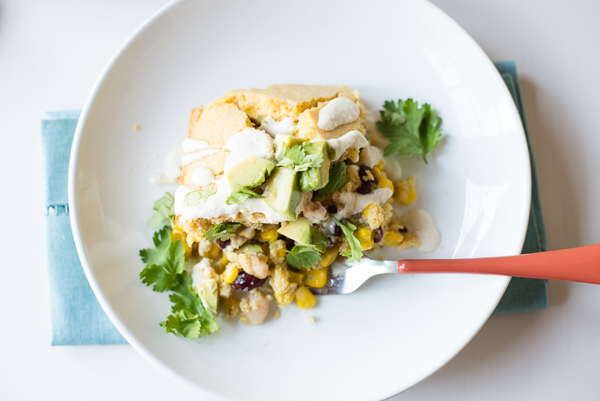 This gluten-free tamale pie has a yummy filling made from two kinds of beans, corn, and salsa. Read on to see just how easy it is to make and to enter the Back To School giveaway. I am a Pamela’s Baking Partner this year and I’m enjoying every minute of it! I have been creating recipes to share with you and also using the products in our everyday cooking and baking. I’ve looked at my partnership with Pamela’s as a bit of an experiment. 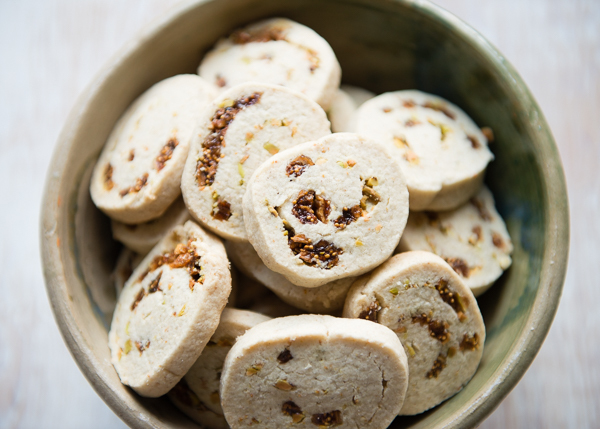 I first tried the Artisan Flour Blend last year when I made Chai-Spiced Snowball Cookies. (I love that blend!) But I hadn’t been accustomed to using gluten-free mixes yet. I’m not shy about saying that my family prefers homemade over store-bought. I don’t usually buy mixes of any kind – gluten-free or not. We’ve got some tough critics to please in our family, including me. If I do buy a mix, it has to be really good. Over the summer I decided to use Pamela’s mixes in all of our gluten-free baking and cooking so I could share my honest opinion with you. I don’t like to recommend anything to anyone that I don’t use and love myself. Gluten-free baking is SO hard to get right. A lot of gluten-free baking mixes taste too artificial and/or have too many additives. 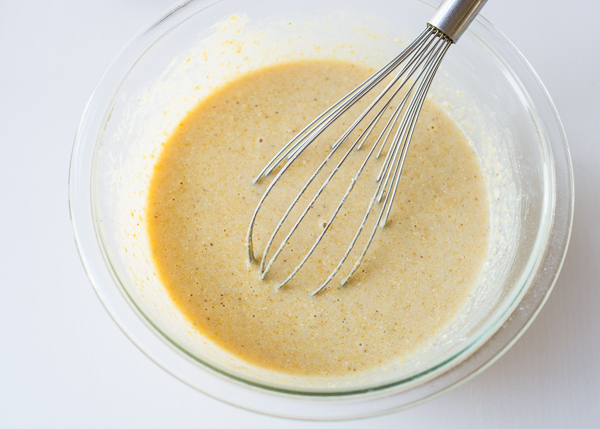 I want baking mixes that taste like I made them from scratch. Pamela’s Products are free of artificial flavors, preservatives, and additives. They use GMO-free ingredients whenever possible. 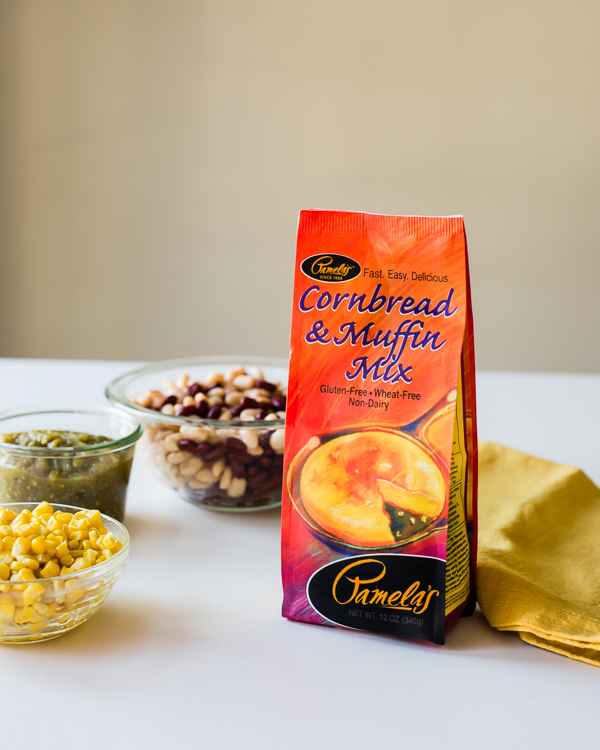 And I can honestly say that every one I’ve tried has been fantastic, including this Cornbread and Muffin Mix. I loved that dinner only took me maybe 10-15 minutes of actual effort. Then I popped it into the oven and helped my kids with homework while it baked. So easy and such a hit with my tough critics. Now, I’ve made this dairy-free and vegetarian as well. The filling is really easy to change up. You can use gluten-free enchilada sauce instead of salsa, use different kinds of beans, add more protein (meat, chicken, mushrooms), etc. My grandma’s original recipe called for sprinkling the top with cheese. I served it up with some cashew cream, which I always have in my fridge, but dairy sour cream works too. Make it your own, I say! And now for the giveaway! 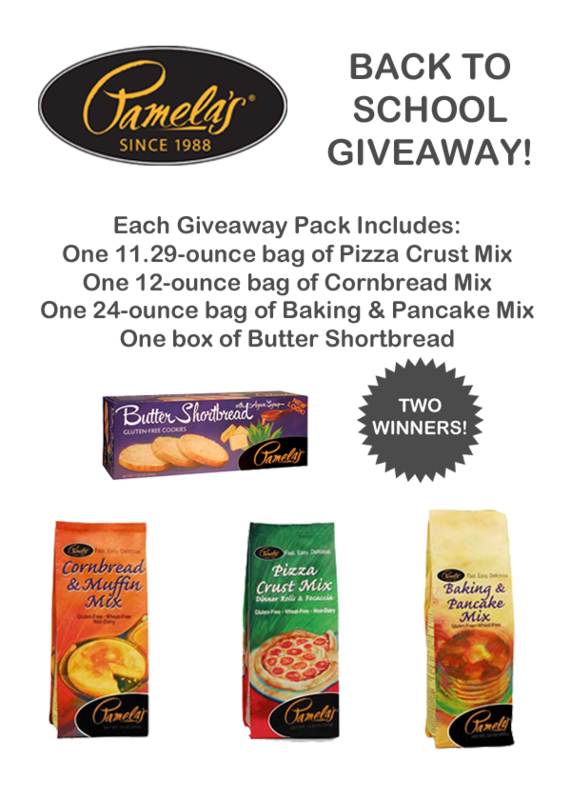 The fine people at Pamela’s let me choose some of my favorite mixes for this Back To School Giveaway. I chose the ones that are really helping me get dinner and breakfast on the table quickly, plus a box of cookies, too, because they are quite simply the best gluten-free cookies we’ve ever had! And…not one, but two winners for this one! All you need to do to enter is fill in your email address in the form below. (Don’t worry, I won’t spam you, it’s just so I can notify you if you win). You can enter every day. 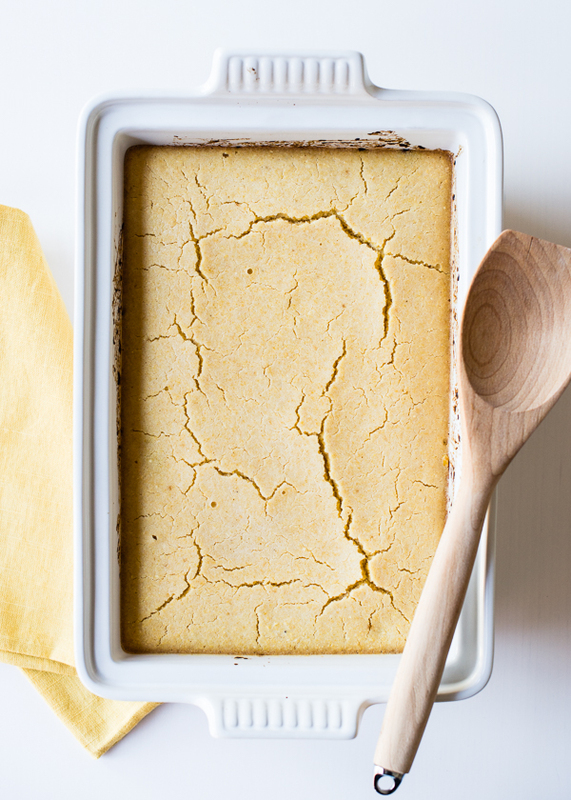 A super easy casserole topped with a lightly sweet cornbread crust. 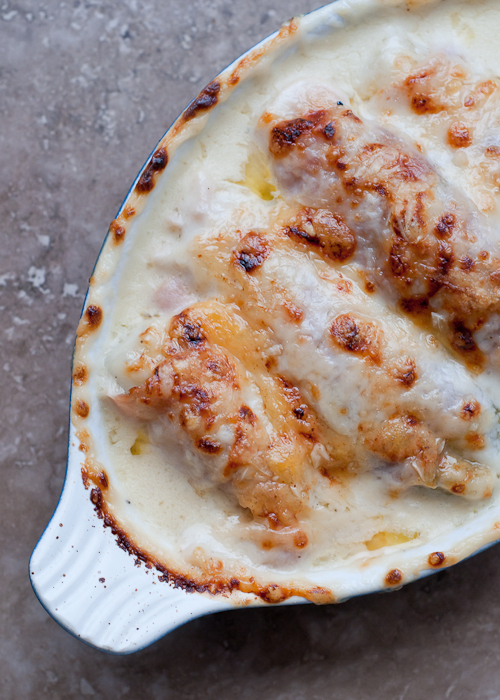 -The casserole may bake more quickly depending on the type of pan used. I used stoneware which took a little more time to heat up. Metal may cook a lot quicker; glass will be closer to the 30-35 minute mark. 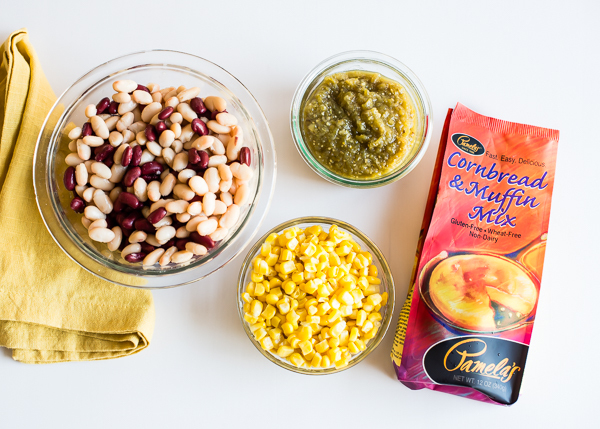 You only need a few simple ingredients – canned or home-cooked beans, corn (fresh or frozen), your favorite salsa, and the cornbread mix plus sugar, water, eggs, and oil. 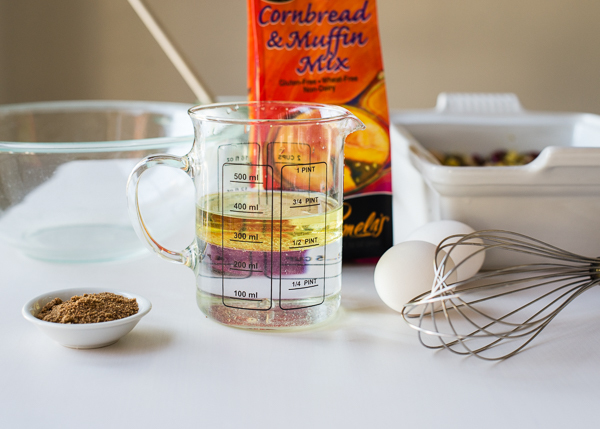 Mix together the filling and spread it in the casserole dish, then mix up the cornbread batter. Pour it evenly over the filling. Bake for 30-35 minutes. 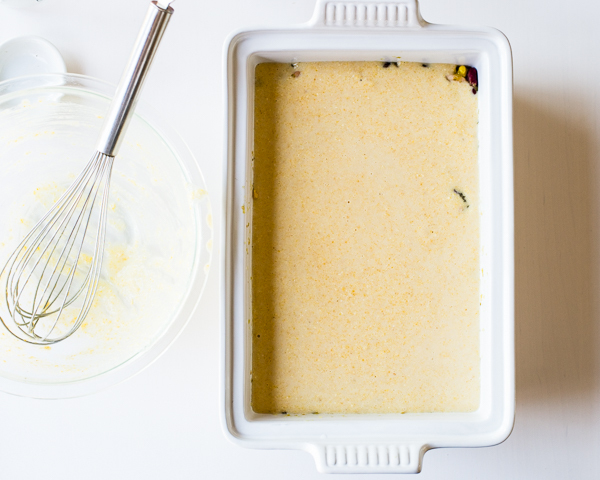 The baking time may differ a little bit according to the type of baking dish you use. This pan is stoneware, so it took a little longer than glass or metal to bake completely. Also, the package directions cite a lower baking temperature. I use a higher one to account for the filling needing to heat up to cook the bottom of the batter. Be sure to test for doneness by inserting a toothpick into just the top part. It should come out clean. If there’s any raw batter on the toothpick, bake for an additional 5-10 minutes. If the top starts to brown too quickly, cover with foil. 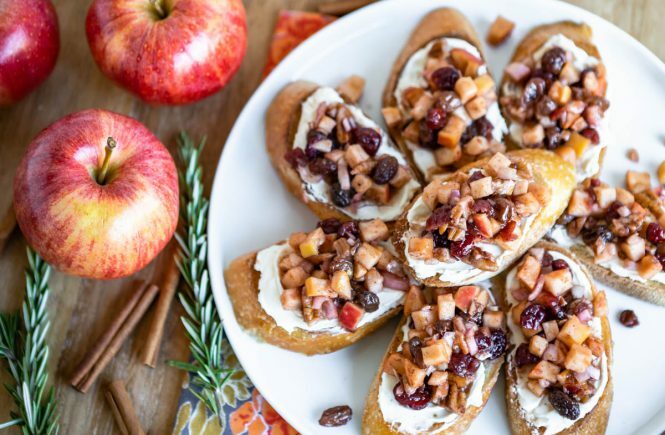 Let it cool for a few minutes, then serve it up with your favorite toppings and garnishes! Disclosure: This recipe was created for Pamela’s Products as part of the Pamela’s Baking Partners program. All opinions expressed are 100% my own. I only use and recommend products and companies I truly love and use in my own kitchen. Love love love Pamela’s Products! What an awesome way to use them girl, this looks insanely good! Pinned! My parents first introduced me to Pamela’s products and I fell in love with their pancake mix. 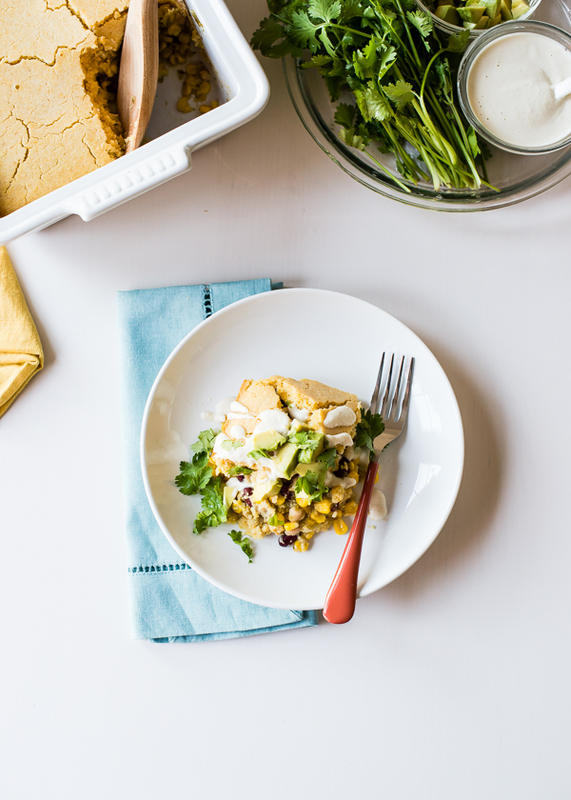 I love the idea of making this tamale pie! And yes, we are believers in family dinners, too. It’s a great time to reconnect at the end of the day. The pancake mix is my very, very favorite. My kids can’t tell the difference when I use it. Thanks, Dara! Pamela’s is THE BEST gluten-free products. Love how you used it here. Gorgeous pie! I am seriously blown away by this. The picture of the cracks on top where all you see is the crust? Love it. I will look for Pamela’s in the market! I actually met THE Pamela this weekend at Expo East! Love this recipe because I miss tamales so much. I’m so jealous! I hope I meet her sometime down the road. I sure do love the products she’s created! I’ve yet to try Pamela’s but have heard such great things. 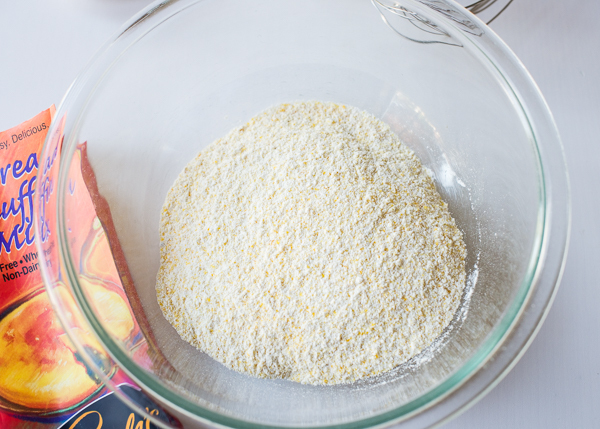 I’m one of those people who doesn’t have to eat gf, but I absolutely LOVE gf flour mixes. So yeah, I need to get on this one. Gorgeous shots too! I love tamales! What a great and easy tamale dinner! What a great recipe! I have been working with Pamela’s as well and I’m LOVING their products! You are so darn talented! Love this recipe! Will definitely have to try these mixes! I never tried Pamela’s Products, but I can see how they can make dinner a lot easier to throw together on busy nights! I doubled the water in this recipe BY MISTAKE and had to make a second pie. I thought I had created a tamale soup. Oh, well, I baked it anyway along with the new pie. One hour later I took the “mistake” out of the oven; crispy top, bubbly sides. Our company liked it just as well as the original recipe. In the “mistake” I did use olive oil instead of veg or canola etc. I kind of liked it better. Also I used La Victoria Verde sauce in the “Mistake” and I liked that better than the one I used in the second pie. Pamela’s gluten free cornbread/muffin mix was a hit on both. 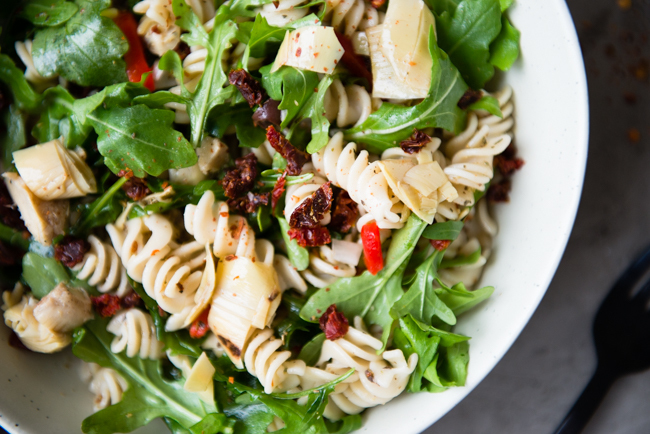 There is much you can do with this really good recipe.